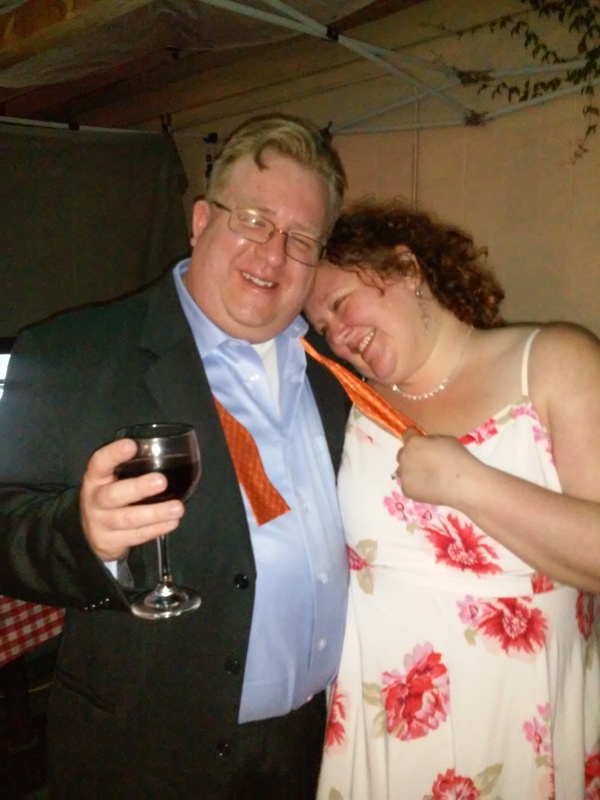 Share the adventures as I try new recipes and projects! As you’ve probably already figured out, if you’ve read any of my other posts, I’m one of those people, who routinely leaps before looking when it comes to projects. Details, shme-tails…I’ve learned lots of lessons in life that way. And that’s not a bad thing. It’s taught me…click HERE to continue reading. My creativity continues to emerge this year, and I’m enjoying every moment of it! I have found that my perspective – keeping my eyes, ears and heart open to new possibilities, and opportunities has determined my outlook, and I have not been disappointed. Life is full of exciting and fun adventures if you choose to look at it that way. Perspective is everything. My latest creative adventure begins with preparing for a wedding and a trip to Tucson, Arizona. I was honored and privileged with the request and opportunity to make a wedding cake for two very dear friends of mine, who were getting married in Tucson. Although the task seemed rather daunting, I was excited and accepted the challenge. It has been many years since I attempted a cake of that size and level of detail, and I was sure that my mostly self-taught decorating skills would be very rusty. I first became interested in cake decorating in my teens when my Girls Scout Leader in Owls Head, Maine gave the troop a demonstration in basic cake decorating and taught us a recipe for decorating icing. I began to experiment, and during my years living in Tucson I honed my skills, decorating many cakes for birthdays and other occasions. You can see some of my work in the slideshow at the end of this post. That was many years ago, however, during college and my first real job after I graduated. As I got older, like with a lot of things, cake decorating was pushed to the side as my career and life responsibilities increased. As the title of this post suggests, I believe anyone can bake and decorate a beautiful cake. You don’t need a ton of experience, fancy tools or equipment. Using items you probably already have at home or can be bought at the dollar store, plus a very small investment in a few of the basic decorating icing tips, you will have everything you need. Success relies upon a little knowledge, time, patience, and skills that, in this day and age, can be learned through YouTube videos. So you’ve read this far… Have you decided that you’re going to do this? That you CAN do this? If your answer is yes, GREAT! Now what? There are a lot of things to consider. Planning and organization are your best allies to make this a successful project. In this post, I’m going to walk you through the steps and thought processes I used to create this cake. Will it be a tiered cake? Or a cake with columns? Is there a special form pan involved or will you be designing and building the cake in a more freestyle manner? What flavor will the cake be? Will you be using a cake mix or making a homemade cake? Will you have a special filling in the middle of the layers such as lemon or raspberry? If using flowers, will you be using icing, silk or fresh flowers? 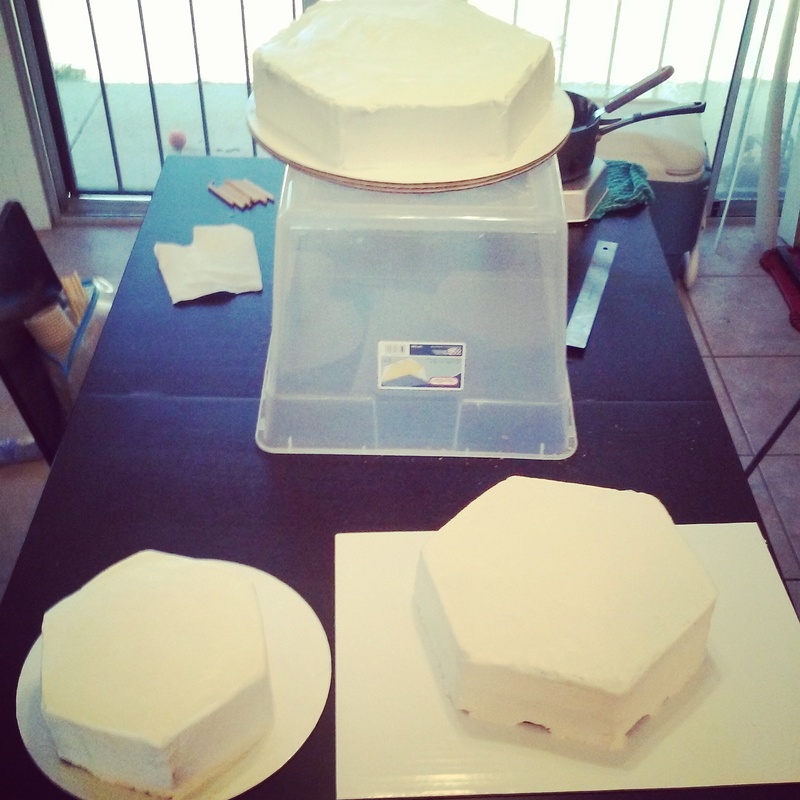 For the Tucson wedding cake, the bride and groom had decided upon a tiered hexagonal cake, and bought a kit that contained four different sized pans. During our discussions, I asked the bride to send me pictures of cakes she liked and to tell me what she liked about them. They wanted a tiered cake, with no columns. They decided on a yellow cake with no special filling. I decided to make homemade cakes. Tiered cakes are heavier than you think they’ll be. In my experience, homemade cakes tend to be a little denser than cakes made with a cake mix, and I wanted the security of that denseness to help ensure that the bottom tiers of the cake could withstand the weight of the upper tiers. 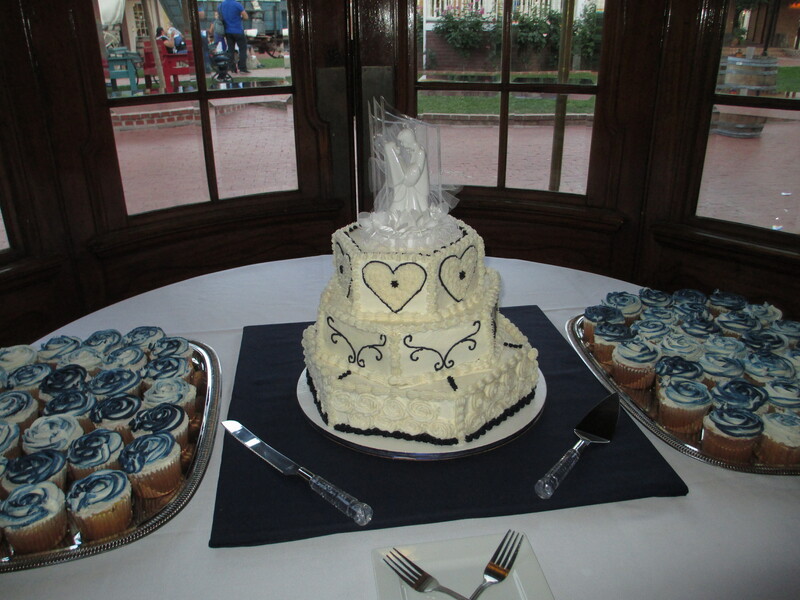 Both the bride and groom preferred buttercream to fondant, which is good, since I have no experience with fondant. The wedding colors were navy blue and white. The bride and I discussed silk flowers, but in the end she decided on a simpler design in which I incorporated the large roses that you see on the bottom tier. This is where the rubber meets the road. If you’re like me, you can sometimes get caught up in the excitement, and end up biting off more than you can realistically chew. This is the time to test whether or not you’ve done that. Now that you have your design, or at the very least you have a basic idea of what you want it to look like, it’s time to evaluate if you have the skill level to successfully achieve the look you want, and logistically what it’s going to take to create. As I mentioned earlier, there are YouTube videos for everything! If you are a beginner, or someone like me that has some skills but may need a refresher course, there are videos that will help you. Anything from how to bake a cake to specific icing designs can be found. Mentally walk through the process of cake construction and determine what skills you already have, and those that you need to learn. Make a list. As I started watching videos, new things would occur to me like, is there an easy way to level a cake layer, so that each tier is flat and even? And yes there are videos out there for this, and later in this blog I’ll tell you how I did it. Tip: Practice while you’re researching. Once you decide on some of the design work, make a small batch of icing to practice what you’ve learned. The experts make it look easier sometimes than it actually is. Use a piece of parchment or wax paper to pipe your designs out and then scrape them off to use the icing again. Tip: To ensure you cover all bases, think of baking, constructing and decorating your cake from the inside out. If making a cake from scratch, do you have a good recipe? If you’re looking for a really good yellow cake recipe, click HERE for the recipe I used. If making a multi-tiered cake, you may want to consider some sort of inner support. What type of icing will you be using? Two of the most popular are buttercream and fondant. There are different techniques for applying each of these. If you are using buttercream, HERE is the recipe that I used that proved to be very reliable. Will you have to transport the cake? If so, how will you transport it? Will you transport in one piece, or multiple pieces and assemble at destination? Environmental conditions – Will the cake be stored / served in a cool place. Temperature is important when considering the type of icing to use. Ingredients. How much flour, sugar, butter, powdered sugar etc… are you going to need? In order to do this, you’ll have to know how many batches of batter / icing you’ll need. For instance, when I was making the wedding cake and cupcakes, I found out that the one batch of batter would make 22 jumbo cupcakes, or 2 – 9″ cakes. So, break that information out and apply that to the number and size cakes you are making and then calculate the number of cups of flour, sugar, etc then convert to pounds. One of the things I learned is that the number of cups per pound varies depending on what you’re measuring. To give you some idea of the amounts we’re talking about in constructing large cakes, I used 14 lbs each of butter and powdered sugar in the baking and construction of the wedding cake – the tiers were 9″, 12″, 15″ plus an additional 100 jumbo cupcakes. How much time is it going to take to bake the cake(s)? Where / how will you store it? Where will you construct it? 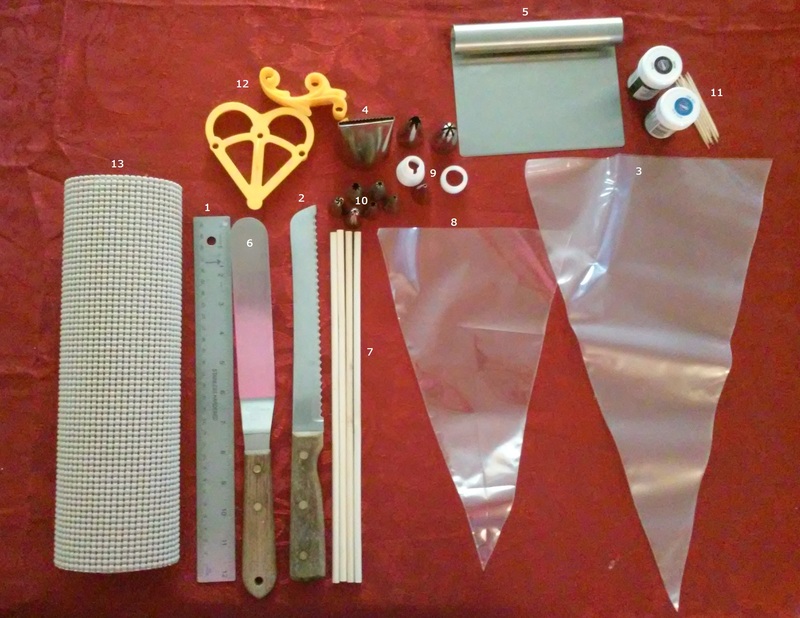 Do you have all the necessary tools to make and decorate it? It’s GO time! You’ve got your recipes, your supplies. You’ve learned or honed the skills you need through videos, and maybe some practice. Now it’s time to put your skills to the test. To give you a practical idea of time and lessons learned, I’ll walk you through my experience. It always takes longer than you think it’s going to. At least not when I’m constructing it. Having made a few tiered cakes before, I knew that it was going to take me a few days to complete. As I mentioned before, I made a three-tiered wedding cake – the base cake was 15″ in diameter, then 12″ and the top cake was 9″. In addition I was baking 100 jumbo cupcakes. I arrived in Tucson on Tuesday night. Wednesday morning my friends and I went shopping for supplies and ran some other wedding errands. Thursday was all about baking. I started out with the cupcakes which took most of the day. It doesn’t sound like it should, but consider the following: each batch of batter only made 22 cupcakes, so add the time to make the batter from scratch, fill the pans, bake the cupcakes which took about 20 minutes per batch, wash the equipment – measuring cups, bowls, beaters, etc and repeat the process 4 more times. That’s pushing close to five hours in cupcakes alone. Because of their size, the cakes take longer to bake. The shortest time was for the 2 – 9″ cakes which was 25 to 30 minutes. The larger cakes took closer to 40 minutes to an hour each and unless you have two of each pan, you are only baking one at a time. and 100 jumbo cupcakes and from start to finish it took me 3 solid days of baking and decorating to complete. I’ll walk you through the basic process and add the lessons, tips and tricks that I learned in preparing for and building this cake. We’ll start out with the tools I used, and what I used them for. Ruler – This turned out to be a crucial tool. I watched several videos to see if there was an easier way, but in my case, there was not. The easiest way to level a cake would be if your cake ended up being higher than the top of the baking pan. If that were the case, you could simply remove the cake from the pan to let it cool, then place it back in the pan and and then laying the blade of a long knife across the top of the pan, simply cut across, always keeping the blade flat. Unfortunately, my cakes were not that tall, so I used the ruler to measure the lowest point on the cake and then, with a small pointy knife, I continued around the cake, holding the small blade flat and making small deep cuts at the corrected height. Once the all the cuts, I switched to a long serrated knife. Long serrated knife – For the smaller cakes, using the small cuts previously made, I could make one continuous cut across the cake turning it as I went to make sure I was at the correct level. 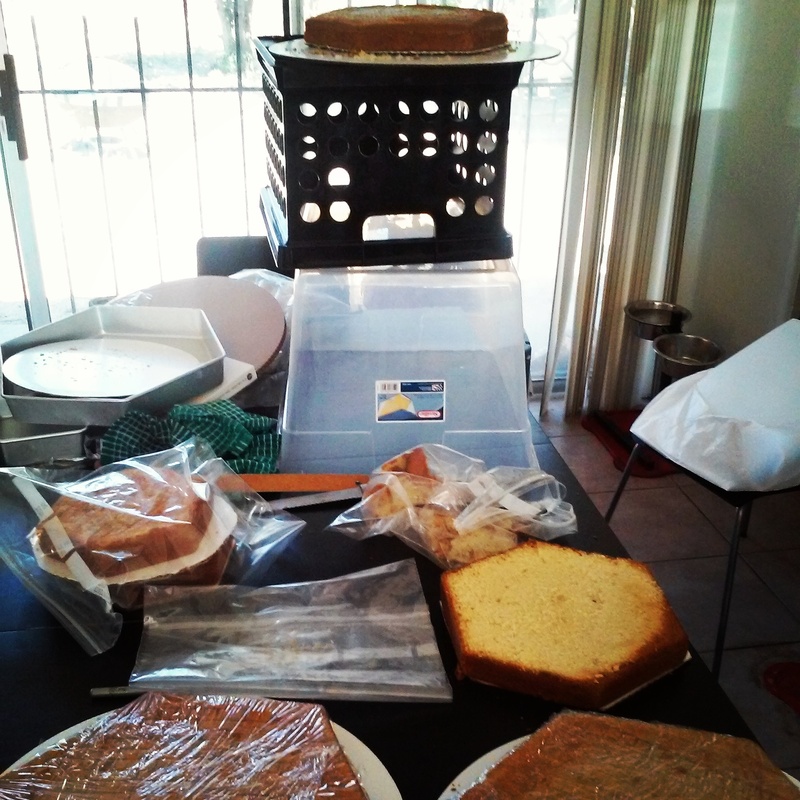 For the larger cakes, I made a cut through several of the previous cuts and then cleared that cake away. I did that all the way around the cake, taking off pieces as I went. When I got all the way around, there was only a small area in the middle that I still had to cut. Keeping my blade flat on the leveled cake I could easily level the center, going around using smaller cuts if the blade was not long enough. Tip: You’re in this for the long haul. Be sure you’re comfortable. It was much easier for me to be accurate measuring and cutting the cake if it was higher up. You don’t need a lot of fancy equipment. Don’t be afraid to “MacGyver” solutions using items that you have available. Is it pretty? No. But it did work? Perfectly. 3. & 4. Large icing bag & #789 cake icer tip – This was the first time I had used the Wilton Cake Icer tip #789. It was a HUGE success, and saved me a lot of time! You will need to use a large icing bag or you will find yourself refilling the bag a lot. I used a 16″ disposable bag. There are video tutorials out there that are very helpful. The pluses that I found using the tip were: less time consuming, easier to achieve an even layer of icing, easier to get a smooth finish. I highly recommend watching a tutorial and giving it a try. 5. & 6. Pastry scraper & flat spatula – Both are very handy in achieving a smooth finish. I bought the pastry scraper at one of the big discount dollar stores for about $4.00. Make sure you get one that has a handle that is flush with the scraper part. The scraper was very handy for easily smoothing the sides of the cake, but I found the spatula easier to use on the top of the cake. Tip: For easier icing spreading and smoothing, be sure to keep your scraper or spatula clean. Each time you take it off the cake, clean excess icing off, dip it in very hot water, shake off excess water and continue smoothing the icing. Tip: If you’re having trouble getting your icing super smooth, let it dry until it’s not sticky to the touch. Take a piece of copier paper, or even tissue wrapping paper, lay it flat on the top of the cake, or flush against the side, and very gently, using the flat of your hand, smooth it out like you would if you were trying to smooth out wrinkles. Gently lift off the paper and move it as necessary. 7. Wooden dowels – These can be found in the cake decorating section of a craft store in packages of 12. The idea of using the dowels is that it’s a way to take to pressure off the bottom cakes. Most of the weight of each tier will be supported by the dowels, not the cake. Be sure to use cardboard circles cut to the size of the cake under each tier. Measure the height of the cake and then cut the dowel so that when pushed in, it will be flush, or slightly below the top of the icing. For example, to support the 9″ cake, I used six cut dowels. I placed them in a circular pattern a couple inches smaller than the 9″ tier, and put one dowel in the middle. The larger the cake being supported, the more dowels you will need. 8. Disposable Icing bag – This is a 12″ icing bag. It’s a good size for icing used in decorating. The key I’ve found is not to put too much icing in at a time for a couple of reasons – 1) It’s harder to hold the bag and apply an even, steady pressure when the bag is too full, 2) The icing gets warm and doesn’t hold it’s shape as well. 9. Coupler and ring set – To use or not to use? You don’t have to use a coupler set with your decorating tips. You can simply place the tip in your disposable bag, and cut an opening in the bag that allows about a third to a a half of the tip to come through. The only time I use a coupler and ring is if I’m going to use more than one type of tip per icing color. When you use a coupler, the coupler goes on the inside of the bag. Cut the bag so that about a third of the coupler comes through. Don’t worry if the threads of the coupler are still covered. You’ll place the tip on the coupler on the outside of the bag and secure it with the ring. Changing tips is as easy as removing the ring and replacing the tip. 10. Decorating tips – For the wedding cake, I used several open and closed star tips and a round tip. 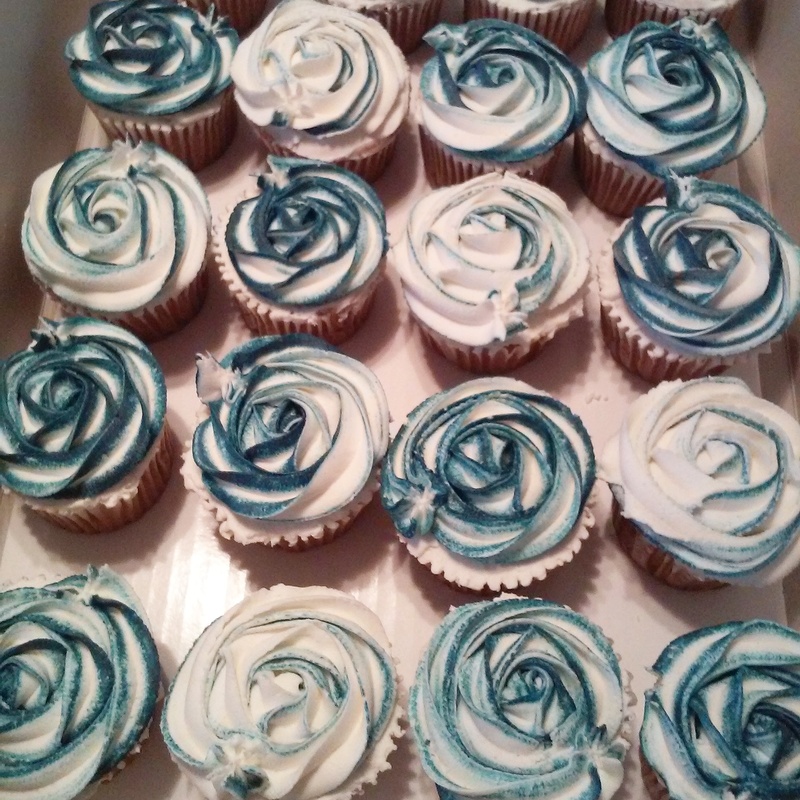 For the large rose design on the cupcakes I used Wilton tip #2D which is a large closed star tip seen in the picture (see figure #4) on the end. 11. Icing gel – I would suggest using icing gels such as those made by Wilton instead of food coloring. A little icing gel goes a long way and produces a vibrant color that does not change the consistency of your icing. To get your desired color, start adding gel a little at a time. I found that using a toothpick worked well for me. You dip it in the gel once, touch it to your icing and throw it away. That way your gel doesn’t get contaminated with icing. Tip: Who knew that Navy Blue icing gel would be impossible to find? Turns out that Royal Blue and Black icing gel make navy blue! Learn something new every day! 12. Decorating press sets – These make it very easy to create consistent designs. You don’t necessarily have to buy a set. Look around, get creative. You might have something already that you can use to create a design, or try creating your own. 13. Non-Slip Shelf liner – This was very handy in two different applications. I used it between the cake and the decorative plywood board it was placed on. I also used it under the cake when transporting it, and it worked perfectly. Tip: As I mentioned before, tiered cakes can get very heavy. Think about how and what you’re going to place the cake on for transport and serving. I used three cardboard rounds taped together under the base tier, and glued on navy blue ribbon to cover the edges. Once I began putting the tiers together for decorating, I constructed the cakes on top of a plywood board covered in fabric that ultimately the cake would be served on. To avoid getting the fabric dirty during decorating, I simply covered the fabric with paper towels. I put a square of the non-slip shelf liner on top of the covered board and then constructed the tiers on top of that. I was then able to very easily move the cake without worrying about it sliding. That’s it folks! With a little planning and preparation ahead of time, my wedding cake / cupcake project was virtually stress-free, and turned out to be a huge success! I had my design. I knew what I needed. I had my recipes and tools, and I gave myself plenty of time to get it done. Now it’s your turn. Get out there and start creating! Best wishes to you on your cake decorating adventures! A long time ago…Examples of cakes I baked back in the day, and some recent ones too. I have used this recipe several times, most recently to make a wedding cake and cupcakes – see Picture Today entry: Tips for Constructing & Decorating a Cake When You’re Not a Cake Boss. This recipe will make a half sheet cake, 2 – 9 inch rounds, or 22 jumbo cupcakes. This cake has a great buttery taste and is moist and a little dense. It’s the perfect consistency for large or tiered cakes. To ensure ingredients combine properly, make sure all ingredients are at room temperature before using. Use shortening and flour to grease pans, rather than cooking spray or butter. It’s been my experience that using shortening and flour to coat pans makes it easier to remove the cake from the pans, and keeps the crust intact making it easier to frost. Oil can be substituted for butter. Butter provides a great flavor, but makes a denser cake than when baking with cooking oil. I have experimented with using half butter which still provides a great flavor, and half oil which makes the consistency of the cake a little lighter. Once you have filled the baking pans with batter, gently tap the pans a couple of times on a flat surface to distribute and even batter out, and release any large air bubbles. Preheat oven to 350° Grease and flour pans. In a large bowl, combine all dry ingredients. Work butter into dry ingredients until you have a sandy consistency. I find that this is easier if you slice the butter up into chunks and then add it to the dry ingredients. Use a fork, pastry blender or, if using a mixer, the paddle attachment seems to work the best. Add slightly beaten eggs to milk mixture and stir to combine. Add approximately half of the liquid mixture to the butter / dry ingredients and mix on low to combine, scraping bowl to ensure all ingredients are combined. Add the rest of the liquid and beat until thoroughly combined – approximately 1 minute. Be careful not to over mix. Over mixing will produce a denser, rubbery consistency, rather than a light and fluffy consistency. Mix until the ingredients are combined and the batter has an over all even consistency, making sure to scrape the sides of the bowl, to ensure that all ingredients are incorporated. Pour batter into prepared pans. Time for baking will depend on the size pan you are using. It’s been my experience that a 9” cake generally takes about 20 minutes, though I check it at 15 minutes and adjust the time appropriately. For jumbo cupcakes, I would start with 10 minutes and then test by inserting a toothpick into the center. Cake is done when toothpick inserted into the center of cake / cupcake comes out clean. Allow to cool. For cakes, I generally let them cool on racks in their pans for about 10 minutes. Cool completely before frosting. If you read my blog post: Tips for Constructing and Decorating a Cake When You’re Not a Cake Boss, this is the icing I used to decorate the wedding cake and cupcakes, and it was a big success! I did a lot of research to find just the right decorating icing that I hoped would taste good and hold up in uncertain weather. You never know what kind of weather April will bring to Tucson. I lived there for ten years and remembered that early Spring can run the gamut for temperatures. I needed an icing that I could count on to hold up even if the weather was warmer than anticipated. I was not disappointed. As usual, I cobbled a few recipes together and came up with this recipe that did not fail me. This creamy, great tasting icing can be used to simply frost a cake or to decorate with. It holds it’s shape beautifully! 2 c of butter or shortening is needed for the amount of confectioners sugar. I found that, in the environment I was working in, equal amounts of butter and shortening had just the right amount of creaminess and firmness to use to both cover the cake and decorate it. Experiment with different amounts. More butter will create a more flavorful creamy texture, but it might not hold up for decorating purposes. The more shortening you use the less likely the icing is likely to melt. If you use all shortening, I would suggest adding a butter flavor extract, or using butter flavored shortening to enhance the overall icing taste. Mix 1/3 c of hot (almost boiling water) with 2 T of powdered coffee creamer. Stir until creamer is completely dissolved. Cool and set aside. In a mixing bowl, using paddle attachment (if you have it) combine butter, shortening and vanilla. Beat on medium until combined. Add 1 c of sugar and mix on low until combined. Scrape bottom and sides of bowl. Continue to add 1 c at a time until mixture is stiff, mixing on low only until combined. Be sure to scrape bowl often to ensure all sugar is incorporated. By now you should have added close to half the sugar. Add 2T of creamer mixture and beat on low just until combined. Continue adding the rest of the sugar and more creamer liquid until you get the desired consistency. Scrape bowl, and beat mixture on medium high or high until smooth and creamy.